The Cuisinart Private Reserve Wine Cellar is the compact solution for wine storage! By maintaining the ideal storage temperature, the Cuisinart Private Reserve Wine Cellar ensures that up to eight bottles of wine preserve their signature bouquet, flavor and body. Use the electronic touchpad to set the preferred temperature (between 39º-68ºF) and the thermoelectric cooling system holds the temp, quietly and efficiently. 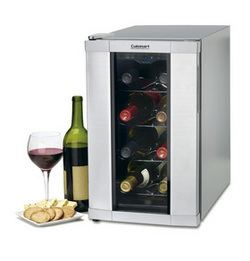 An attractive stainless finish ensures any wine collection is displayed in style. Cuisinart offers so many amazing products, they have definitely become a brand that we know and trust in our home. Cuisinart's quality always goes without saying, they offer top of the line item's and stand behind their products (what consumer doesn't love that?!). While we are not regular wine drinker's we do appreciate wine, so the 8 Bottle Private Reserve Wine Cellar is the perfect size for us! Ready for use right out of the box (no assembly required), plug it in and your ready to go! There are so many different features; including a menu on the touch pad that shows you the best wines to pair with different food's. The adjustable thermostat ensures that the wine that your storing is stored and the optimal temperature to maintain freshness and taste. 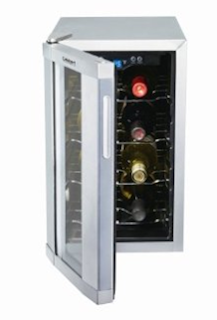 The Cuisinart Private Reserve Wine Cellar has adjustable feet (fitting on a most counter tops easily - and under most cabinets). With a double pain window, and stainless steel finish it adds a wonderful touch to the decor of every kitchen! The Cuisinart 8 Bottle Private Reserve Wine Cellar would make an amazing Holiday gift for the novice wine drinker & wine enthusiast's alike. Experience the Cuisinart 8 Bottle Private Reserve Wine Cellar this Holiday! One Lucky reader will receive a 8 Bottle Private Reserve Wine Cellar! Leave a comment~Visit Cuisinart at http://www.cuisinart.com/ and let me know another product you'd like to gift or receive this Holiday Season. The comment is considered your entry. Entry to this giveaway ends at 12pm PST December 18, 2010. Winner's are chosen randomly through random.org. The winner will be announced in a post within 7 days of the giveaway ending, and contacted through email. The winner will have 48 hrs. to respond or another winner will be chosen. I Would really like to get the Burr Grind & Brew Thermal™ 12-Cup Automatic Coffeemaker for Christmas! I really need a new one! Follow you and love the Convection Toaster Oven! Seeing as how my blender went out and died on me I would probably buy the SmartPower Deluxe Duet™ Blender/Food Processor. I Have been wanting the 20 cup processor for forever!